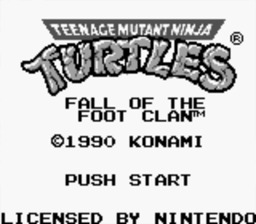 Play Teenage Mutant Ninja Turtles: Fall of the Foot Clan Now! PUT YOURSELF IN THEIR SHELLS-CHOP! CHOP! Now, you're primed to take on the Kung Fu dictator Shredder and his newest recruit Krang, an arch alien warlord. This ultimate Sewer War consists of five never seen before stages of destruction, including the Waste Dump Ravine and Technodrome Tower. At the end of each stage a super-powered High Karate Dude will do his/its best to pummel you. In order to advance to the next stage you must counter this maven of mayhem's pounding with your own brand of pulverizing.